I’ve recently put some music up on Soundcloud (https://soundcloud.com/sundaydance). I’m mostly going to use it as a platform for stereo mixes of the electroacoustic stuff I’m doing at Bangor, but it will also be a repository for some back catalogue and maybe a few gems from the vault. There are a few nwdlbot examples which I will incorporate into this site some time soon. Take a listen. All CD albums on Sunday Dance Music are now reduced to £8.00 (plus postage and packing). 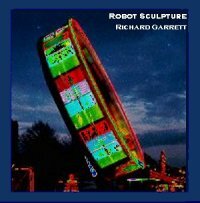 Robot Sculpture has been listed in the Picks for 2003 on Eric Meece’s radio show Mystic Music. Mystic Music broadcasts from noon to three, every Friday on KKUP 91.5 FM in Cupertino, California. "Thank You so much for perfectly brilliant Robot Sculpture!!! We were glad and proud discover Your splendid, incredibly interesting work, for us and for our audience, touch highest culture and mastery." Thank you Serge for your kind words. Robot Sculpture is available for purchase online from this site. It is a surprise to learn that the beautifully haunting soundscapes conjured by electronica maestro Richard Garrett on his latest recording venture Robot Sculpture started life as algorithms and constraints in an audio package. The post-production and overdubbing required to then translate these pieces into the aesthetic artforms that they are now must have been an enormous undertaking. …In parts the album is not dislike Clint Mansell’s soundtrack work for films such as Pi and Requiem for a Dream. Guitar tones vary from metal… to the delicate acoustic. A short surreal Zappa-esque baroque whimsey is sharply followed by unearthly minimalist piece like John McLaughlin’s intro to Aura. These experiments are extended for some time before returning with an Irish jig (Welsh surely?) and another track with elegantly phrased chorus-FX guitar. …overall, this album is a great achievement as a solo project, displaying some excellent playing and superb programming and mixing. In a musical world dominated by overproduction and electronic prostitution, here we find a wonderful sensitivity for what is enough, what is suitable and what is right. This is a very interesting electronic music release by UK artist Richard Garrett. All the tracks except for 2 start by using SSEYO Koan Pro generative music software. The software generates random midi events within a few preset rules such as pitch and duration. This output is fed into the JV-1080 synthesizer and mixed. IF acceptable, the rest is used for making compositions, which include many different instruments from horns to guitars to flutes to tabla drums. Only some of the tracks are ambient space atmospheres. Track 3 is like piano jazz. “Highland Roads” (Track 6) contains some nice guitar playing you might describe as a bit Pinhas or Fripp inspired. “That Was No Yellow Ferrari” is bit like something Zappa might have composed. Interesting. You can really hear the Indian influence on some songs, from the keys in which the songs are played or the tabla drums. This is quite an interesting mixture of material and contains some nice guitar work. This approach really works well for Richard. I really loved the last track, “The Breath Of The Grey King”. It made me feel like I was sitting out in the middle of nowhere in Wales in ancient times and looking up at the sky as a meteor storm blazes across the sky and I look up in amazement, not having any idea what is happening but enjoying the beauty of the moment. A very nice release. Un nuevo nombre a añadir a la lista de sintetistas británicos que sin embargo se escora lo justo del estilo que ha definido la música electrónica llegada desde ese país. Mucha más expansiva y vasta en horizontes, la música de Garrett introduce elementos sinfónicos a estilo Andy Pickford y una pizca de sabor étnico que posibilitan un sonido caleidoscópico cuya núcleo es ciertamente cósmico pero alrededor del cual orbitan sonoridades de rock, el folk y el jazz. Realmente sorpresivo y apetecible. A new name to add to the list of British synthesists, but one who stretches the boundaries of the style that has defined electronic music coming out of the UK. Far more expansive and far-reaching in its vision, Garrett’s music introduces symphonic elements in the style of Andy Pickford and a pinch of ethnic flavour that enables him to produce a kaleidoscopic sound whose core may well be cosmic but which also embraces hints of rock, folk and jazz. Genuinely surprising and enjoyable.